Arterial dissection occurs when intraluminal blood penetrates into layers of the vessel wall. Cranio-cervical dissection accounts for 15-20% of causes of stroke in the young population. Cervical extradural internal carotid artery (ICA) vessel dissection accounts for 80%, and vertebral artery vessel dissection accounts for 15% of all cranio-cervical dissections., Bilateral dissections of the carotid or vertebral arteries occur in 15% of cases and, therefore, investigations should always include the complete imaging of vessels of head and neck.,, Extradural dissections manifest with ischemic symptoms due to vessel occlusion or clot emboli, and rarely as bleeding into the sphenoid sinus or middle ear, as cranial nerve paresis, and sometimes as Horner's syndrome. In both the traumatic as well as the spontaneous type, the dissection usually extends cranially and ends at the petrous segment. Most of the stenosis associated with extradural dissection resolves with heparin and anticoagulant therapy. Surgical or endovascular treatment can be considered if ischemic symptoms persist despite adequate medical treatment. The intradural dissection is different from the extradural spontaneous dissection as the former may cause severe morbidity and mortality in patients presenting with subarachnoid haemorrhage (SAH) or with nonhemorrhagic symptoms of ischemia, headache, cranial nerve palsies and other focal deficits.,,, An intradural internal carotid artery (ICA) dissection manifests with unilateral headache followed by symptoms of stroke and less commonly as SAH. Isolated middle cerebral artery (MCA) or anterior cerebral artery (ACA) dissections present with stroke. The majority of the intradural vertebral dissections have SAH as presentation and they also often present with headache, vertigo, nausea, vomiting as well as lateral medullary syndrome., Intracranial dissections not only occur spontaneously but are also seen following the occurrence of trauma, due to iatrogenic injuries, and in the presence of arteritis such as fibromuscular dysplasia, polyarteritis nodosa, etc. The pathophysiology of dissection injury is similar for extracranial or intracranial locations but clinical manifestations differ depending upon the extent of injury to the wall and the hemodynamic features at the injury site. The absence of internal elastic lamina in intracranial vessels makes the clinical manifestations different from that of extracranial dissections. Penetration and extension of blood into the vessel wall results in an intramural hematoma. If this intramural hematoma extends between the intima and media layers of blood vessels, it causes complete occlusion and presents as ischemia. The continued flow through the damaged vessel in partially patent vessels may cause dissemination of emboli. Blood flowing between the media and adventitia may cause a dissecting aneurysm or a SAH (if the dissecting aneurysm ruptures)., In most of the cases, dissection is sub-intimal so SAH is rare. Intradural dissections of M1 segment of the MCA and basilar artery may be associated with occlusion of perforators causing ischemia in their respective territories. The MCA seems to be most common location accounting for about 41%, followed by the vertebro-basilar arteries in 23%, the internal carotid artery in 21%, and the anterior cerebral artery in 13% of the cases, respectively. The initial site of dissection is proposed to be between the intima and the media and subsequently all the layers of the arterial wall are destroyed causing a SAH. Progression of dissection as well as its spontaneous healing are likely to produce large partially thrombosed aneurysms, which later on become giant following further recurrent episodes of dissections. True dissections are difficult to diagnose, as angiographically, only a few cases are picked up relative to their actual incidence. The angiographic criteria for detecting dissections are the stagnation of contrast in the aneurysmal pouch, presence of stenotic segments proximal or distal to the ectasia, and the more likely fusiform appearance [Figure 1], [Figure 2], [Figure 3]. The typical description is the presence of a pearl-and-string sign, sometimes associated with a pseudoaneurysm, as seen in [Figure 4]., Radiologically, an intramural hematoma can be demonstrated on T1 weighted magnetic resonance imaging (MRI) as an area of increased signal intensity, while there is a thick ring-like or a railroad-like enhancement corresponding to the double lumen on contrast MRI or on angiography as seen in [Figure 1]. One has to differentiate between saccular and dissecting aneurysms as their treatment varies due to the presence of a fragile vessel wall in the case of dissecting aneurysms. The management of a dissecting aneurysm involves changing its hemodynamic flow pattern either by medication, endovascular therapy or surgery. The treatment depends on the clinical presentation, collateral circulation, access-related difficulty for both the surgical and endovascular approaches, the presence of any leptomeningeal anastomoses, the contralateral flow and also the expertise available. No class 1 studies exist regarding the treatment of intracranial dissection and all our experience stems from treatment of acute stroke or subarachnoid haemorrhage. 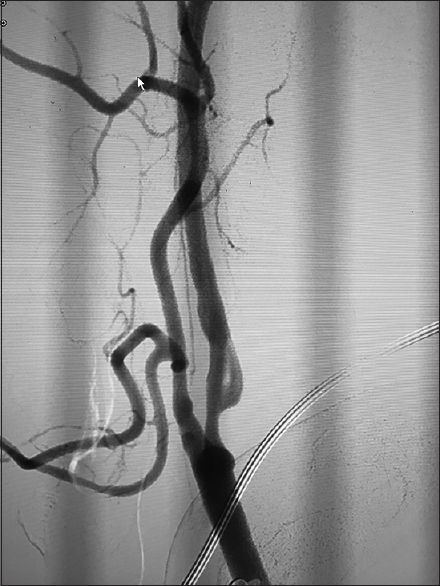 There is a high risk of morbidity and mortality after a rebleed, especially in dissecting aneurysms, and therefore, this entity needs an aggressive surgical or endovascular treatment., Patients with non-aneurysmal ischemic intracranial dissection can be administered pharmacological treatment in the form of heparin, followed by warfarin or antiplatelet medication. Patient with acute stroke, or recurrent strokes not responding to pharmacological treatment can undergo stenting and balloon dilatation or surgical bypass followed by occlusion or trapping of the diseased segment., In patient with fusiform dilated aneurysms, the role of surgical treatment consists of clip reconstruction of the vessel, wrapping of the aneurysm, and clipping or trapping of the parent artery and its revascularization, especially if insufficient leptomeningeal anastomoses or collaterals are present., Endovascular treatment includes proximal occlusion of the parent artery using materials [Figure 3], using coils or detachable balloons, trapping of the diseased vessel proximally and distally, or surgical distal bypass followed by parental vessel occlusion.,, Reconstructive techniques involve preservation of the parent vessel using stent-assisted coiling [as in [Figure 2]], or vessel remodelling using flow diverters with or without coiling.,,, Sometimes, communication between the mural hematoma and vessel lumen will continue to be active through reverse flow despite occlusion of the artery or exclusion of the parent vessel lumen from the dissected portion of the vessel wall. Deploying a flow diverter stent with a good radial force causes approximation of the dissecting flap against the vessel wall and may enhance healing in such cases. Anson J, Crowell RM. Cervicocranial arterial dissection. Neurosurgery 1991;29:89-96. Thanvi B, Munshi SK, Dawson SL, Robinson TG. Carotid and vertebral artery dissection syndromes. Postgrad Med J 2005;81:383-8. Ohkuma H, Suzuki S, Ogane K. Dissecting aneurysms of intracranial carotid circulation. Stroke 2002;33:941-7. Moonis G, Hwang CJ, Ahmed T, Weigele JB, Hurst RW. Otologic manifestations of petrous carotid aneurysms. AJNR Am J Neuroradiol 2005;26:1324-27. Songsaeng D, Srivatanakul K, Krings T, Geibprasert S, Ozanne A, Lasjaunias P. Symptomatic spontaneous vertebrobasilar dissections in children: Review of 29 consecutive cases. J Neurosurg Pediatr 2010;6:233-43. Chaves C, Estol C, Esnaola MM, Gorson K, O'Donoghue M, De Witt LD,et al. Spontaneous intracranial internal carotid artery dissection: Report of 10 patients. Arch Neurol 2002;59:977-81. Caplan LR, Baquis GD, Pessin MS, D'Alton J, Adelman LS, DeWitt LD,et al. Dissection of the intracranial vertebral artery. Neurology 1988;38:868-77. Sturzenegger M. Headache and neck pain: The warning symptoms of vertebral artery dissection. Headache 1994;34:187-93. Krings T, Geibprasert S, terBrugge KG. Pathomechanisms and treatment of pediatric aneurysms. Childs Nerv Syst 2010;26:1309-18. Sasaki O, Ogawa H, Koike T, Koizumi T, Tanaka R. A clinicopathological study of dissecting aneurysms of the intracranial vertebral artery. J Neurosurg 1991;75:874-82. Stehbens WE. Aneurysms and Anatomical variation of cerebral arteries. Arch Pathol 1963:75:45-64. Shin JH, Suh DC, Choi CG, Leei HK. Vertebral artery dissection: Spectrum of imaging findings with emphasis on angiography and correlation with clinical presentation. Radiographics 2000;20:1687-96. Lin CH, Jeng JS, Yip PK. Middle cerebral artery dissections: Differences between isolated and extended dissections of internal carotid artery. J Neurol Sci 2005;235:37-44. Yisen Zhang, Ming Lv, Conghai Zhao, Ying Zhang, Xinjian Yang, Zhongxue Wu. Endovascular treatment of ruptured vertebrobasilar dissecting aneurysms: Review of 40 consecutive cases. Neurol India 2016;64:52-61. Uhl E, Schmid-Elsaesser R, Steiger HJ. 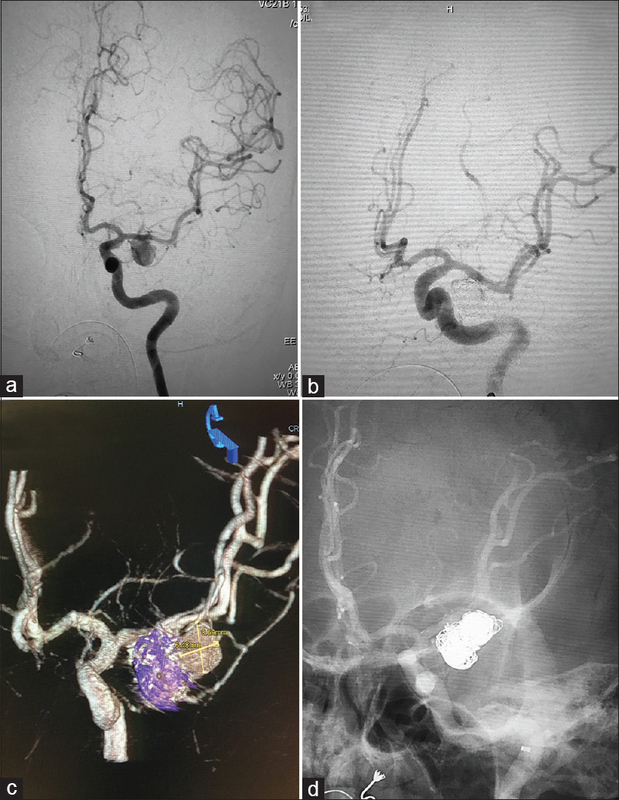 Ruptured intracranial dissecting aneurysms: Management considerations with a focus on surgical and endovascular techniques to preserve arterial continuity. Acta Neurochir (Wien) 2003;145:1073-84. Grigoryan M, Haussen DC, Hassan AE, Lima A, Grossberg J, Rebello LC, Tekle W, Frankel M, Nogueira RG. Endovascular treatment of acute ischemic stroke due to tandem occlusions: Large multicenter series and systematic review. Cerebrovasc Dis 2016;41:306-12. Gory B, Piotin M, Haussen DC, Steglich-Arnholm H, Holtmannspötter M, Labreuche J,et al. Thrombectomy in acute stroke with tandem occlusions from dissection versus atherosclerotic cause. Stroke 2017;48:3145-8. Sugita K, Kobayashi S, Inoue T, Banno T. New angled fenestrated clips for fusiform vertebral artery aneurysms. J Neurosurg 1981;54:346-50. Anxionnat R, de Melo Neto JF, Bracard S, Lacour JC, Pinelli C, Civit T, et al. Treatment of hemorrhagic intracranial dissections. Neurosurgery 2003;53:289-301. Aymard A, Gobin YP, Hodes JE, Bien S, Rüfenacht D, Reizine D,et al. 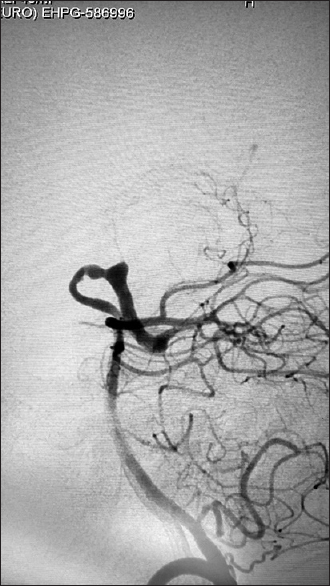 Endovascular occlusion of vertebral arteries in the treatment of unclippable vertebrobasilar aneurysms. J Neurosurg 1991;74:393-8. Kurata A, Ohmomo T, Miyasaka Y, Fujii K, Kan S, Kitahara T. Coil embolization for the treatment of ruptured dissecting vertebral aneurysms. AJNR Am J Neuroradiol 2001;22:11-18. J.P.P. Peluso, W.J. van Rooij, M. Sluzewski, G.N. Beute and C.B. Majoie. Endovascular Treatment of Symptomatic Intradural Vertebral Dissecting Aneurysms. American Journal of Neuroradiology 2008;29:102-6. Lylyk P, Miranda C, Ceratto R, Ferrario A, Scrivano E, Luna HR,et al. 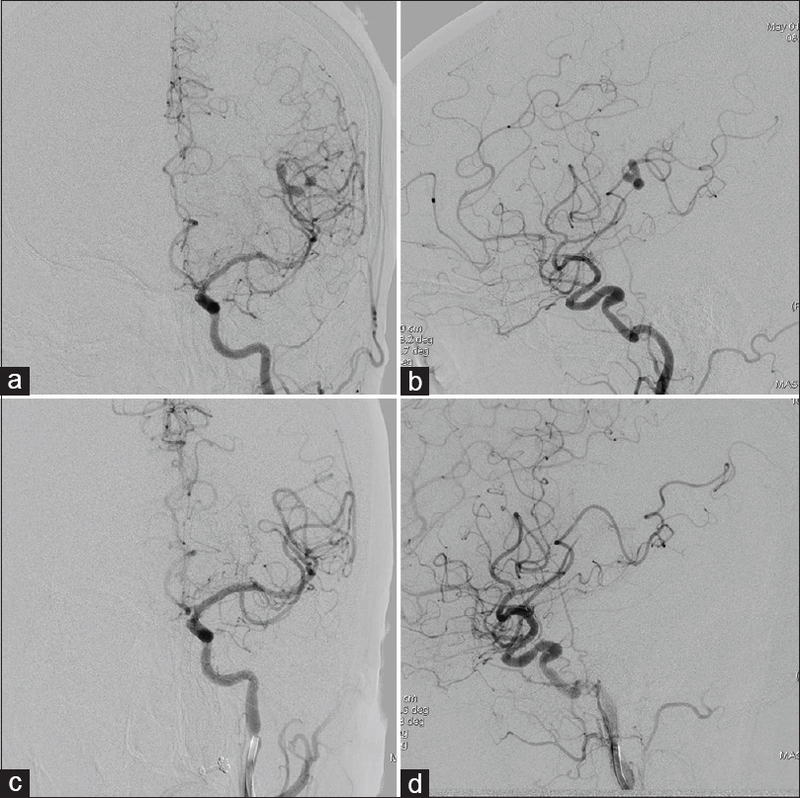 Curative endovascular reconstruction of cerebral aneurysms with the pipeline embolization device: The Buenos Aires experience. Neurosurgery 2009; 64:632-42. Ogata A, Sakata S, Okamoto H, Abe T. Ruptured dissecting aneurysm of the recurrent artery of Heubner: Consideration of pathological findings. Neurol India 2017;65:623-5. Ramgren B, Cronquist M, Rommer B, Brandt L, Holtas S, Larsson EM,et al. Vertebrobasilar dissection with subarachnoid hemorrhage: A retrospective study of 29 patients. Neuroradiology 2005;47:97-104.